Blessed with an incredibly efficient transit system, not only do trains run like clockwork, they are also insanely clean and safe. A dizzying array of train and subway lines, taxis and buses can take you literally anywhere you need to go but for most travellers, the train will be your best bet as the fastest and cheapest. There are however some basic things you need to know about Tokyo’s transit as you start planning that dream trip. Here are my tips for the best way to get around Tokyo by train and figuring out how in general Tokyo transportation works. Looking for suggestions for the best places to eat in Tokyo? Where to stay in the Tokyo? If you’re looking for great places to stay, my recommendation is to take a look on Booking.com whether you’re staying in Tokyo, Osaka, Kyoto, or Hiroshima. They’re probably the most versatile hotel platform now mainly because they not only have a big hotel inventory but they also have a ton of B&Bs as well. As I mention in the Tokyo food guide, the most daunting thing about travel within the mega-tropolis that is Tokyo, Japan, is the transit system. You have to get out of your head the idea of singular subway system as you would have in New York City or the S-Bahn and U-Bahn in Berlin. It is just completely different. Let me break down the reasons why it’s complex but also at the same time why it doesn’t have to be once you have it sorted out and have a good map in your hand. By the end of this you’ll be an expert in Tokyo transportation. Tokyo’s rail lines are incredibly thorough and that’s really only possible because there are multiple competing lines run by different companies. This is where it gets a little confusing because unlike other cities that are at least in part government run, these are all privately held and completely separate of one another. As you can tell from the map above that there are so many lines, circles, and colours that it’ll easily make you dizzy. One of the most popular lines is run by Japan Rail (JR). I like to think of them as the long distance rail company similar to the GO Train in Toronto, or Amtrak in New York. They’re primarily known for the bullet train (hence JR Pass) but in addition, they are also quite intwined with the Tokyo transit because they have quite a number of lines that criss-cross, cut, and circle through the city that make it a very convenient. The major ones to note are the JR Yamanote Line which is the only loop in the city that strategically many of the major neighbourhood centres in the city. The rail company also has a helpful Chūō line which cuts through the center of the city. From there, you have a litany of other lines with JR that can take you to farther reaching districts and prefectures in and around Tokyo. When you think about transit through a major city, I at least think of subways because of what we’re used to in North America. The Tokyo Metro combined with Toei Subway is exactly that. They’re completely underground and has an extensive number of lines that spider into all corners of the city. This is going to be likely your main mode of transportation because of how good it is. You can find Tokyo Metro and Toei Subway by looking for the M logo or the green fan. Think of Tokyo Metro as the precision form of transit that can take you to the very specific corners of the city while the JR line is meant to take you to the major destinations of the city. If that wasn’t enough, then you throw in all of the more regional trains that seem to be owned by all of these other companies that all have their own department store. If you’re just focusing on the best way to get around Tokyo, it’s unlikely you’ll need to take these but if you’re thinking about a day trip up to Tochigi like we did, or perhaps Hakone, you’ll be looking at one of these. You will find looking at Google Maps sometimes that you’ll see these lines pop up as interesting ways to connect from neighbourhood to neighbourhood which is why it’s worth noting. Just keep in mind that these are owned by different companies and on its own will require a completely different ticket. What makes taking the train so complicated in Tokyo? What ultimately makes all of this so complex is that you can’t just pay for a ticket on say Tokyo Metro and be able to switch to the JR line after with that same ticket. They’re owned by separate companies and as a result, they require different tickets and payment. This makes things tricky because let’s say you want to buy a 3 day Tokyo Metro and Toei pass but for one of the days, it would be completely more convenient to ride the JR Yamanote circle line but you can’t because you’re “locked in” to Tokyo Metro/Toei. All of this changes though when you talk about IC cards and the passes that are agnostic to the train company you take. Recently I put together a “where to stay in Tokyo” guide which will help you figure out what neighbourhoods you want to be in for your upcoming trip to Japan. With all the foundational stuff out of the way, now I can move onto what you’re really here to learn about which is, “what the heck do I buy to get around Tokyo?”. Great question. Let’s get started! For most visitors, picking up a SUICA card at a JR station or a PASMO card at non-JR stations will make the most sense to nullify the complexities I mentioned above. These are prepaid cards that won’t give you discounts on single tickets but will allow you to freely use all train, subway and bus networks in the city. With a simple swipe of the card, you’ll be able to get around everywhere you need to go. This way, you can also bypass trying to figure out how to use ticket dispensing machines. You need to pay a refundable deposit of ¥500 to get the card but you can get it back when you return it at a station window. When you run out, simply recharge the card at any ticket machine in ¥1000 increments. There is currently a promotion for what’s called a “Kanto PASMO Card” that’s only available to foreigners. For the price of ¥2000, you get a card that covers the ¥500 deposit and also comes with ¥1500 in prepaid value. You can pick it up at the airport or at specific metro stations. If you plan on doing extensive travel on rail lines during a day, you can consider some of the alternative passes but be careful what rail companies they are valid for. Tokyo Free Kippu (Tokyo 1-Day Ticket) – Unlimited use of all subway and JR lines but at ¥1590, I personally think it is way overpriced. Tokyo Subway Pass – If you don’t need to ride any JR lines, this is going to be the best value out of all these passes. This pass is only sold to foreign visitors at Narita Airport, Haneda Airport, specific metro stations and BIC Camera stores in Tokyo (1 day: ¥800, 2 days: ¥1200, 3 days: ¥1500). Make sure to go to the page to find out all the exact locations. Common One-day Ticket for Tokyo Metro and Toei Subway – This pass is identical to the pass above but more expensive (¥900). So why mention it? Well this pass is open for anyone to buy so in a bind you could buy this at any subway station. Tokyo Metro Open Ticket – This ticket is limited to the Tokyo Metro line. The one day version is ¥600. Airport to Downtown Tokyo Passes – There are a number of combo passes offered at either Narita or Haneda airports that include transportation to the city and then Tokyo Metro passes. Toei One-Day Unlimited Pass – The only reason why you’d want to use this one is if you knew you’d be riding the Toei line exclusively in the day but that is unlikely based on my experience. Costs ¥700. Tokunai Pass – This pass gives you unlimited access to JR lines only for the day at ¥750. Does it make sense to get the JR Pass for just Tokyo? This is a question that probably gets asked the most. 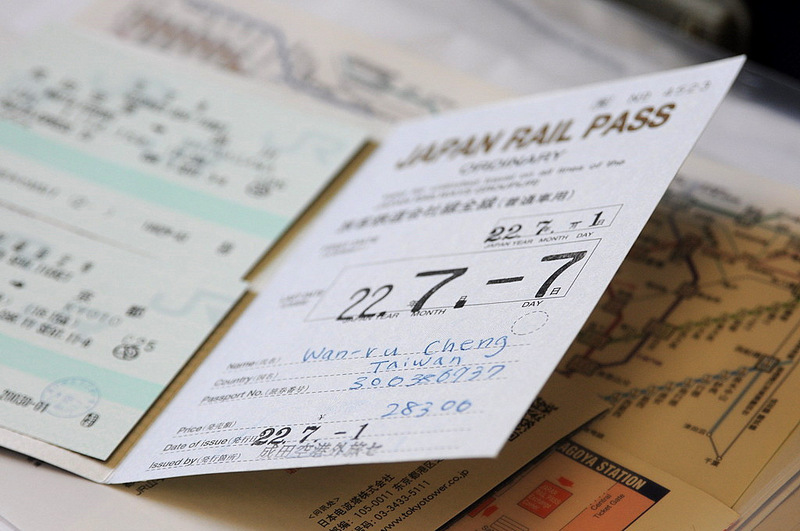 The JR Pass is a foreign visitor-only rail pass similar to the Eurail Pass in Europe that gives you unlimited ride privileges on JR specific lines that can be purchased in 7, 14, and 21 day denominations of consecutive use. From a value perspective, the best use of the JR Pass is when you’re able to use it to take a JR bullet train from city to city. If you’re staying in Tokyo exclusively, it won’t make a heck of a lot of sense just because it would be a lot cheaper to use a prepaid SUICA card or one of the passes mentioned above. My recommendation is to tally up all the trains you’re looking to take by using the Hyperdia tool and see if it makes sense to buy the rail pass. If you do end up deciding on picking up a JR Pass, remember that you can only do it from your home country. During my original trip to Japan, I planned to visit Osaka, Nara, Hiroshima, and Kyoto. In order to take advantage of the JR Pass, I started the trip by doing 7 consecutive days in these cities and once my pass expired, I spent the remaining 5 days of the trip using a SUICA card. Once you get these basics down you’ll be all set to travel around Japan’s capital city. If you’re looking to do any travelling around Japan, I highly recommend picking up a JRailPass. Keep in mind that you’ll need to purchase it before your trip and ship it to your home because you can’t buy it once you’re in Japan. Heading back to Tokyo in two weeks so this is very timely. Do any of the passes operate on the Shinkansen trains? Unfortunately not. These are strictly for use within Tokyo. If you’re looking to use the Shinkansen trains, you’re better off getting a JR Pass but like I mentioned, I’d probably do your exploring in Tokyo at the beginning or end of the trip so you don’t waste the JR Pass. Cheers Will. I didn’t think so, but I wanted to ask someone who had been using the trains much more recently than me! A very informative post. Having lived there I agree with much you say. On my last visit we used a Japan Rail pass and found it to be great value. I did use it when in Tokyo and found it to save a few pennies. If you tailor it right you could use it to get back to Narita airport if you use the Narita Express. So go on tour, come back and use your final journey from Tokyo back to the airport? I’ve also done some pieces on the bullet train and rail pass in my blog. Great minds think alike? Thanks for your comments Navin. Great post on your blog btw!